There’s an interesting new story out on the internet today about the Galaxy S10. Apparently, Samsung has a Galaxy S10 variant (the 5G-enabled model) with a whopping 12GB of RAM onboard. Before anyone gets excited, we felt we should point out that this isn’t an actual specs leak. The leak that many are basing this on is just a screenshot from an analyst report about how smartphone RAM options have risen steadily in 2018 and how they might continue to increase next year as well. Basically, it’s an analyst predicting what could happen, not a proper leak. Samsung could put 12GB RAM on the Galaxy S10, but it won’t. We just got to 8GB of RAM on Galaxy phones with the Galaxy Note 9, after all. While the Galaxy S10 will be special as the tenth-anniversary Galaxy S flagship, we really don’t think such a major RAM upgrade will be one of the highlights. 8GB of RAM is likely to be where the Galaxy S10 specs will max out. Chinese OEMs have already announced phones with 10GB of RAM, but there’s no way Samsung will be able to offer so much RAM without a notable increase in price. Don’t forget: The Galaxy S10 may come with Samsung’s new all-screen display with features like in-display fingerprint sensor and possibly even an under-display camera, so it could already be quite costly compared to previous Galaxy S flagships. 12GB of RAM, in short, sounds too good to be true. And it would be quite useless as well. Samsung’s software isn’t the most optimized, but there’s no reason to have so much RAM on even the most bloated of phones other than as a marketing gimmick. 12gb will make it future proof but they should just make the 8gb ram standard with the 2 top tier models. 10 GB RAM is already unnecessary and 12 GB is a joke. Nobody will multitask PUBG and Fortnite in a phone. 12gb of ram is unnecessary. In fact, our firm has eight Note9 devices and 2 of them are the 8gb versions. In all honesty even 8gb is not necessary as far as the Note9 is concerned so I can’t see even 8gb being needed on S10. They might do it for marketing purposes though. We got the two 8gb Notes not for the ram but only for storage. 8gb isn’t making the phone any faster. Don’t forget it will be 5G enabled so most welcome move by samsung. Not sure, with 5G and five cameras and stuff, Samsung might want to save as much costs where possible, and just sticking to 8GB RAM would be a nice move. 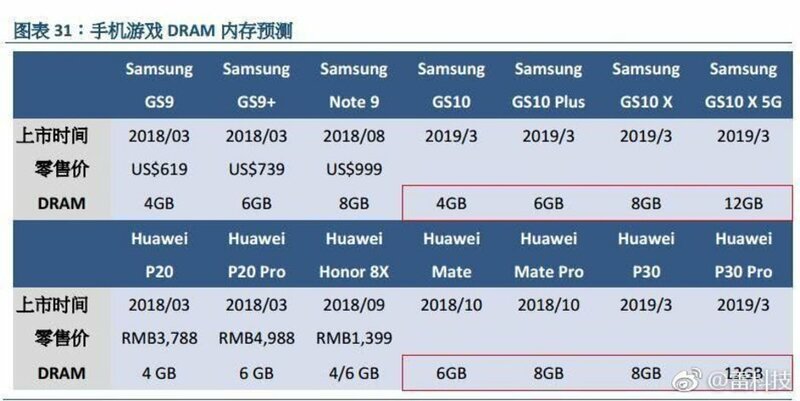 No one is gonna complain, really, just because Chinese phones have 10GB or 12GB. 12GB seems like a stretch but 4GB is too little for 2018 and it will be for 2019.